Rome was founded in 753 BC along the banks of the Tiber River. 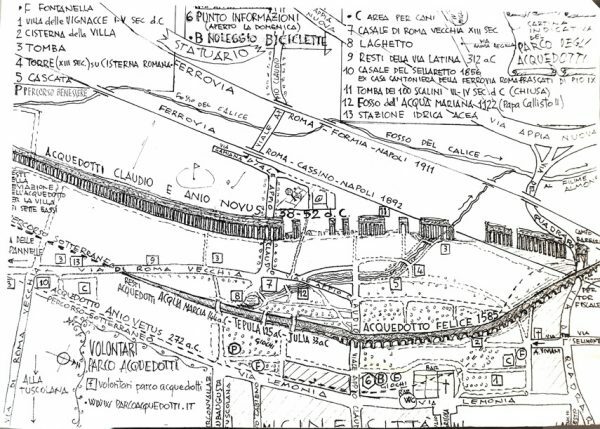 400 years later the Tiber was so polluted, the city needed to find a new water supply. 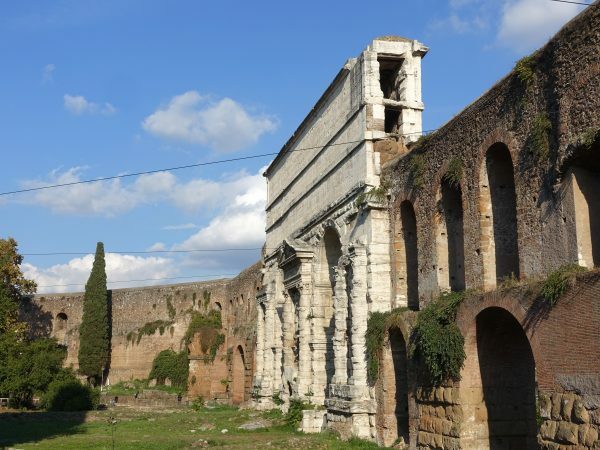 By the year 226 (AD) there were 11 aqueducts bringing in (around) 300 million gallons of water a day to the city of Rome. That breaks down to 200 gallons of water per day per person for 1 million people and 1 million gallons a day for baths, fountains and landscaping. To put this into modern perspective, the average person today will use 100 gallons of water per day, and that’s mostly to flush toilets. It was Appius Claudius Caecus, the 4th century (BC) Censor responsible for the government’s finances, who allocated funds to build Rome’s first aqueduct. 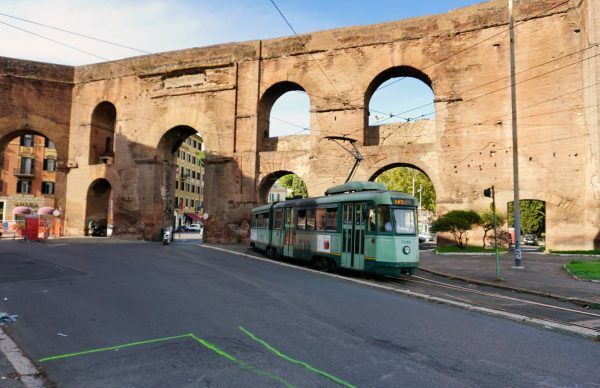 The foresighted Appius understood the growing pains of the city and in 312 BC, he commissioned two of Rome’s greatest achievements of the age, the via Appia and the Aqua Appia. Aqua Appia brought around 20 million gallons of water per day from a spring a about 10 miles from Rome. 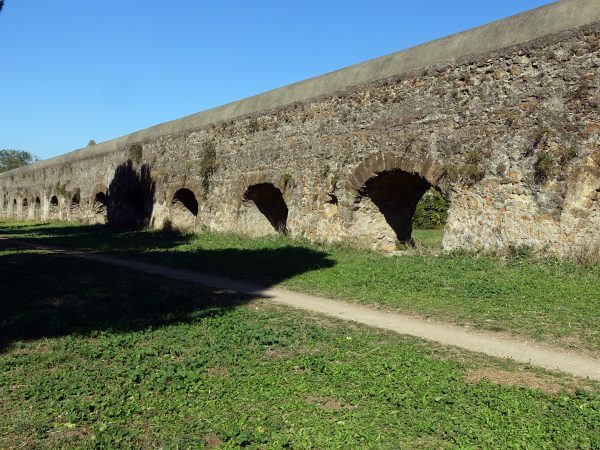 As newer aqueducts were constructed, Aqua Appia’s use became limited until it was essentially used as part of Rome’s sewer system and then discarded altogether. Aqua Appia mostly disappeared from history until 2017. 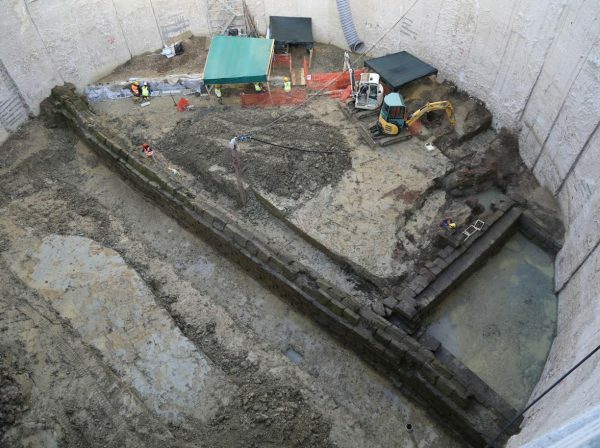 When the city was excavating for the new Metro C, a small section of the ancient water conduit was dug up 18 meters below the Piazza Celimontana. The current plan is to transfer the contents of the Aqua Appia to a museum. 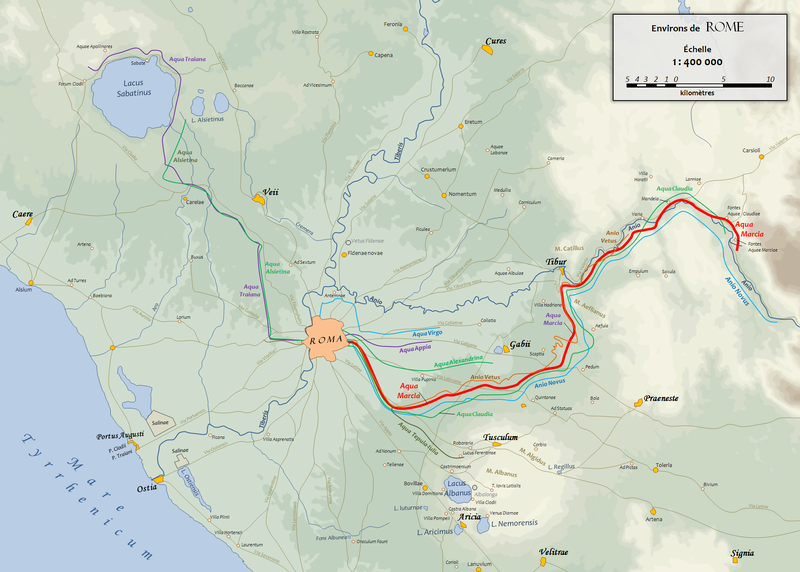 In 275 (BC), after the Romans defeated Pyrrhus of Epirus at Beneventum, they took the spoils of war and constructed Rome’s second Aqueduct, the Aqua Anio Vetus, the first of the long aqueducts, traveling up to 50 miles from the water source in the Anio Valley (modern day Aniene). 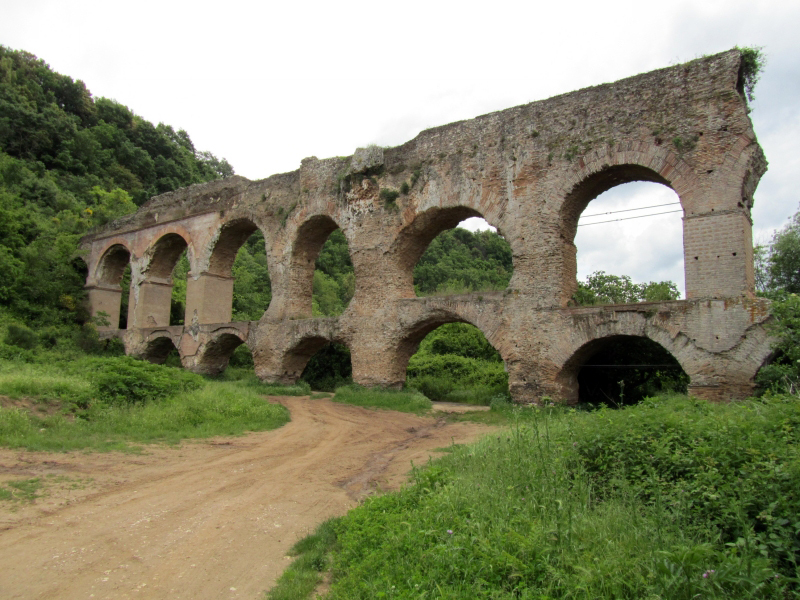 The Anio Valley became a favorite location to source water, producing 4 of Rome’s largest aqueducts. By 146 (BC), as the population of Rome increased, more water was needed. After the conquest of Corinth (Greece) and the final destruction of Carthage, Rome was incredibly wealthy. There was a lot of money for public projects. The Aqua Marcia, named for the Praetor, Quintus Marcius Rex, began construction in 144 (BC). The aqueduct ran an impressive 57 miles from the Anio Valley to Porta Tiburtina, near the Termini train station. In 126 (BC), a new channel was added to the top of the Aqua Marcia to accommodate the Aqua Tepula. As the name Tepula implies, the water was tepid or warm, not very good for drinking, but fine for bathing, fountains and sewerage. 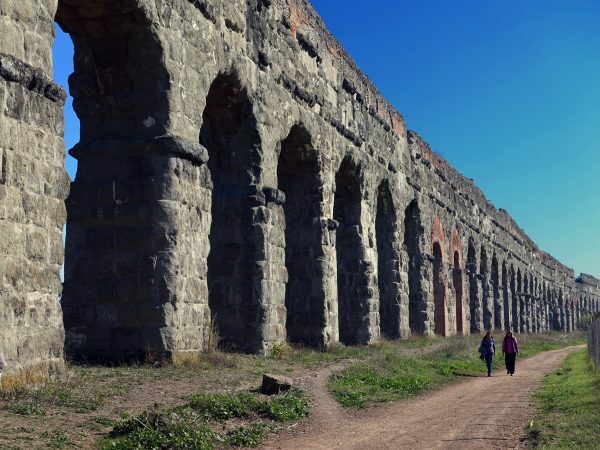 The Aqueducts of Anio Vetus, Marcia and Tepula all joined together along the via Latina, a military road that traveled around 11 miles southeast from Rome to the Alban Hills, the source of the Aqua Tepula. 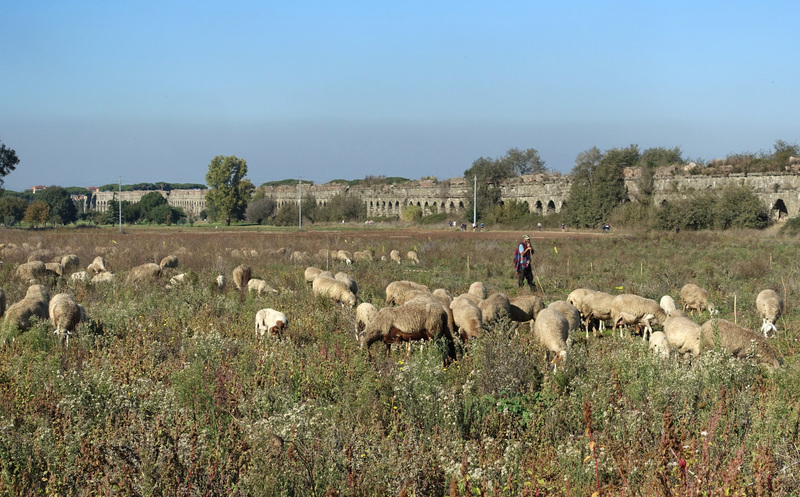 This stretch of the via Latina, about 9km ( 5.6 miles) south of Rome, eventually included the confluence of 7 of the 11 Aqueducts of Rome. The remains of these grand arches are now the centerpiece of the Parco degli Aquedotti, the Park of the Aqueducts. In the year 19 (BC), Marcus Agrippa built Rome’s first public bath complex. The few remains of the Agrippa Baths can still be seen near the Pantheon. Baths required a lot of water and in order not to strain the city’s water supply Agrippa set out to build a new aqueduct. From a source of water in the Alban Hills, southeast of Rome, Agrippa constructed the Aqua Julia, named after the Julian family of Augustus. By the year 33 (AD), the water from Agrippa’s Aqua Julia joined the arches that carried the water of the Anio Vetus, the Marcia and the Tepula. Aqua Julia brought over 12 million gallons of water daily. The combined Anio Vetus, Marcia, Tepida and Julia brought over 62 million gallons of water a day but it wasn’t enough. Rome’s thirst was enormous. In the year 38 (AD), the Emperor Caligula began works on a two new Aqueducts, both procured from the Anio Valley, the same source as the Aqua Anio Vetus and Aqua Marcia, close to 50 miles from the center of Rome. Three years into the project Caligula was killed off and the new Aqueducts (Aqua Anio Novus and Aqua Claudia) were consequently built by the Emperor Claudius. 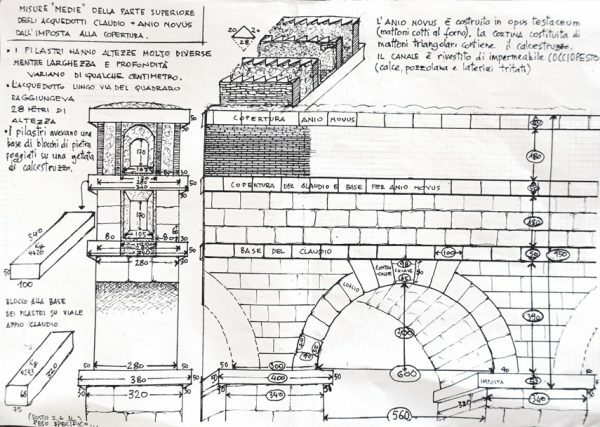 When possible, or convenient, the water from the new aqueducts was carried along the existing arches of the Aqua Marcia, but many of these 300 year old arches needed to be repaired or replaced. By the time it opened in the year 52 (AD), the Aqua Claudia was the most impressive aqueduct ever built in Rome. You can see in the photo above the magnificent engineering at the Porta Maggiore in Rome. Although the arch was built by Claudius, it became one of the gates of the Aurelian Wall in the 3rd century. 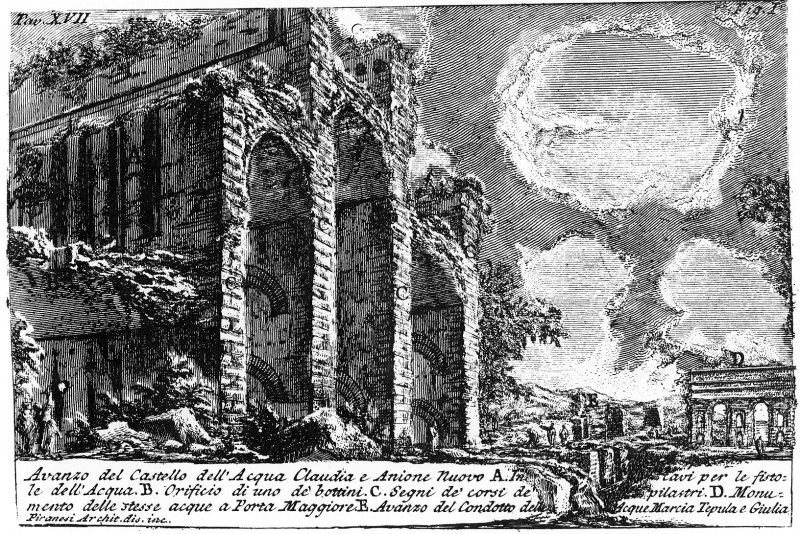 Three 3 channels rode above the arches, carrying the water supply from the Anio Novus, the Claudia and the combined flow of the Marcia, Julia and Anio Vetus in the third. The combined amount of water flowing through the 3 channels brought in close to 150 million gallons of water a day. The Aqua Alsietina, Aqua Traiana, Aqua Alexandrina and Aqua Virgo provided another 50 million gallons per day. These 4 aqueducts did not flow through the Park of the Aqueducts. They were from sources to different parts of the city. The water fed into a water distribution Castellum near the Temple of Minerva Medici near the Termini Train Station. Nothing remains of the Castellum these days. After a massive fire it was torn down and removed in the 1800’s. Aqua Claudia was referred to as ‘Magnificentissimus’. It’s still a marvel to behold with arches soaring over 90 feet towards the sky. However, there were problems. In order to finish the project quickly, there were lots of shortcuts using inferior materials and shoddy labor. Less than 8 years after it opened, it closed for repairs. Then, things got worse. There was an earthquake in the year 62 (AD), followed by a storm that caused major damage to the Claudian Harbor at Ostia. Money was diverted from the aqueduct to repair other parts of the city. Then, two years later, in the year 64 (AD), Rome was devastated by the great fire that destroyed most of the city. 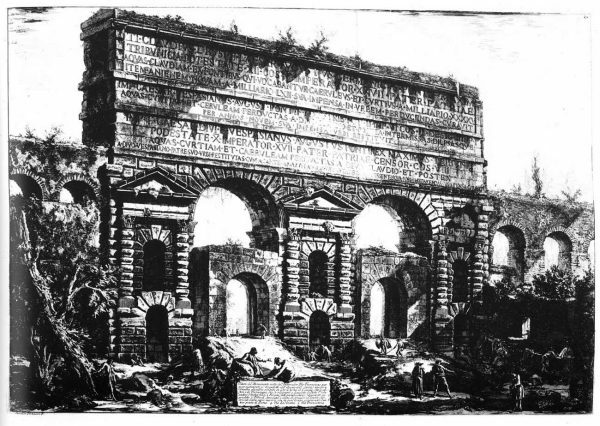 When the Emperor Nero rebuilt Rome, claiming the burnt out sections of the city to build his massive Palace, he repaired the Aqua Claudia but diverted the flow of water into the arches of his personal Aqua Neroniani, a branch of the Claudia used to provide water to his Palace and the lake that later was drained to build the Coliseum. 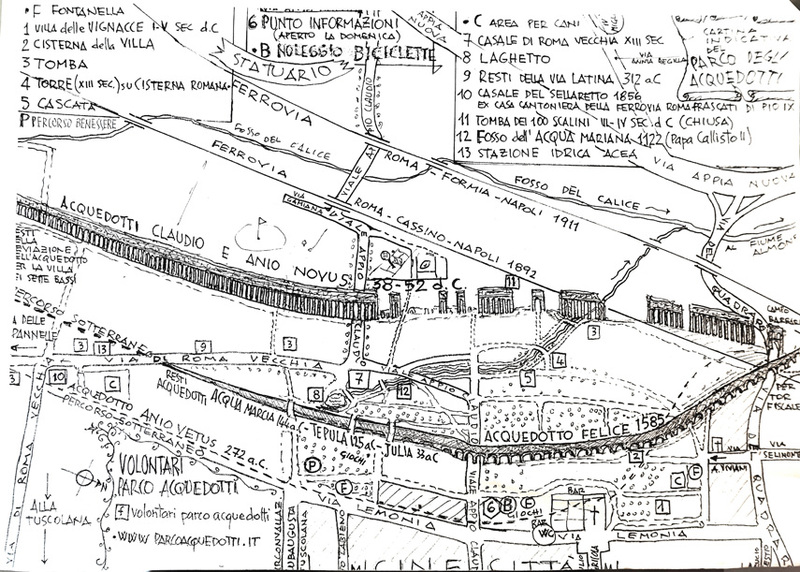 The photo above shows the Arcus Neroniani along the via San Gregorio by the Palatine Hill. In the year 71 (AD), the Emperor Vespasian drained Nero’s lake, built the Flavian Amphitheater (the Coliseum) and repaired and restored the Aqua Claudia. His son, the Emperor Titus made further renovations in the year 81 (AD). Their dedication/inscriptions are still visible on the Porta Maggiore. The top inscription is by the Emperor Claudius. The middle dedication is from the Emperor Vespasian and the lower dedication is from Emperor Titus. 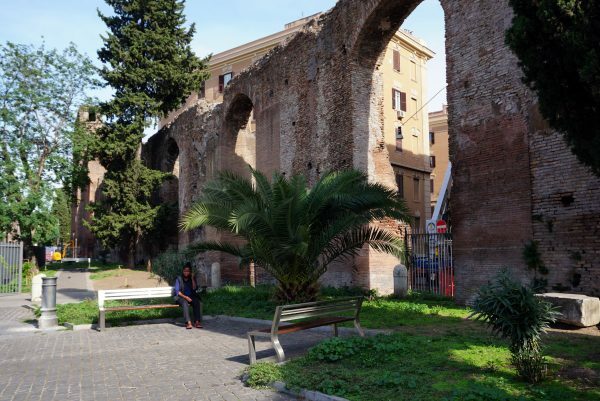 The Emperor Hadrian’s renovations in the 2nd century are still visible along the arches of the Aqueduct Park. If you look closely you can see bricks and lead pipes stamped with his name. 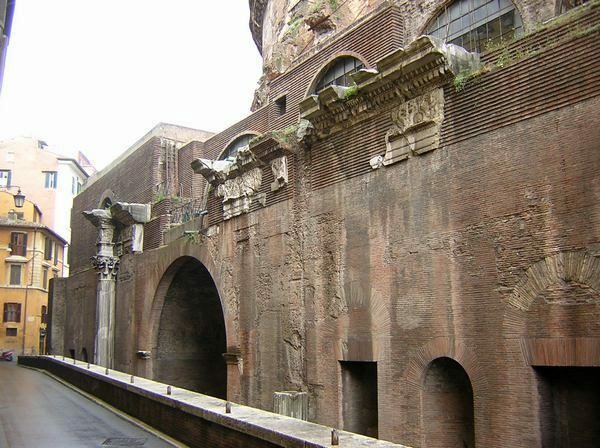 The Severan Emperors (Septimius and Caracalla) maintained the arches in the 3rd century but in the 4th century things took a turn when Constantine moved the center of the Roman Empire to Nova Roma (Constantinople). Artisans moved to Constantinople where there was more work. 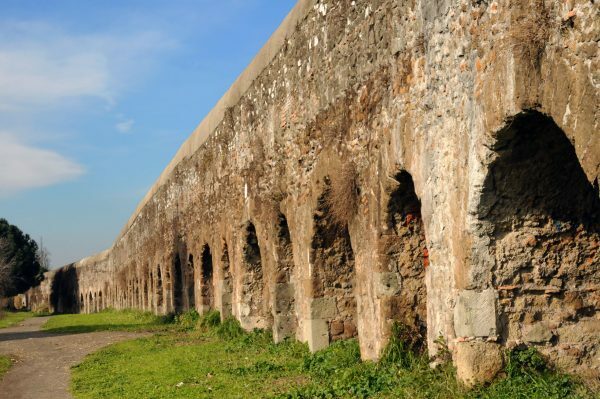 The Aqueducts of Rome began to deteriorate. The walk through the Esquiline neighborhood near the Porta Maggiore will show you many old sections of the Aqua Claudia. Some are big, like this overpass near a water pumping station. Others are much smaller sections that lend a romantic backdrop to neighborhood parks. In the year 537 (AD), during the Gothic wars, the Ostrogoth King Vitiges destroyed sections of the aqueducts in an attempt to starve Rome of the water supply. It worked. The only aqueduct not destroyed was the Aqua Virgo (now the Aqua Vergine) because it was built underground. 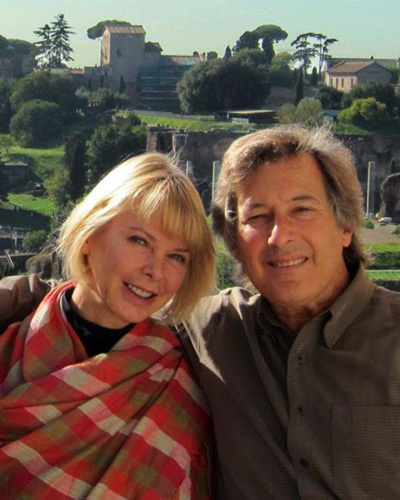 If you’re in the vicinity of the Trevi fountain, take a short walk over to the Vicus Caprarius . You’ll be visiting the ruins of the Castellum, the distribution center, of the aqua Virgo. The Aqua Virgo was restored and renamed as the Aqua Vergine in 1453. It terminates at the Trevi Fountain. At the beginning of the 5th century Rome had 1,212 fountains. 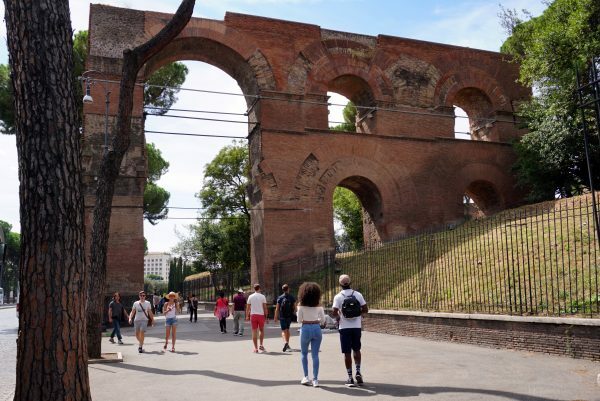 After the Fall of Rome in 410 AD, care of the aqueducts lapsed and by the time Vitiges and the Ostrogoths knocked down the Aqueducts arches leading into the city, barely 100 fountains remained. 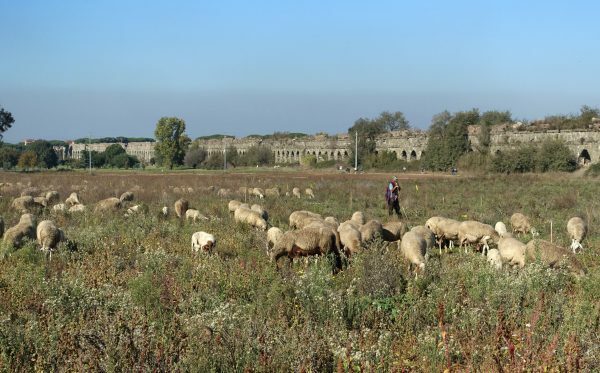 Il Parco degli Aquedotti (Park of the Aqueducts) is a pastoral setting evocative of the 19th century Age of Romanticism that brought classical architecture back into fashion. The arches are segmented but still magnificent, soaring up to 90’ tall over a backdrop for joggers, dog walkers, sheep and a golf course. 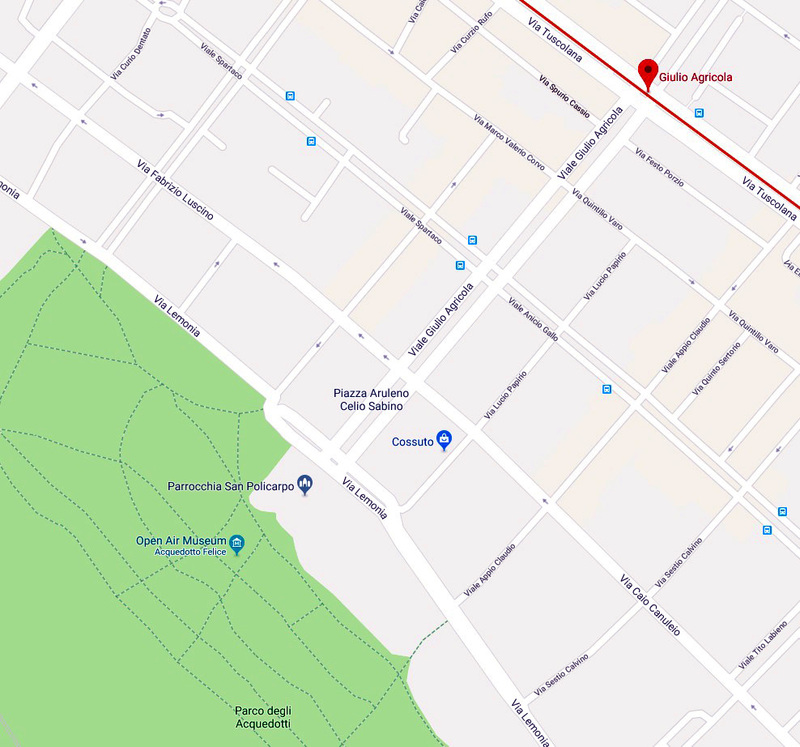 The best way to get to the Park is to take the Metro A line to the Giulio Agricola metro stop, named after the 1st century Roman General Gnaeus Julius Agricola who conquered Britain. His son-in-law, by the way, was the Historian, Tacitus. From the metro station, turn onto Viale Giulio Agricola. Look down the street and you’ll see a large modern looking Church in the near distance. The Parrocchia Di San Policarpo Church is the start of the Park. The arches of the park belong mostly to the towering Aqua Claudia (52 AD) and the not so towering Aqua Felice. In 1586, Pope Sixtus V (Felice Peretti) restored the water from the Aqua Marcia and Aqua Claudia and rebuilt them into the Aqua Felice, named after himself. It traveled 8 miles underground from the source and then 7 miles through low aqueduct arches of the Park of the Aqueducts and into Rome, terminating at the Fontana dell’Aqua Felice on the Quirinale Hill near Piazza Barberini. Aqua Felice carried around 5.4 million gallons a day, distributed to 16 private and 11 public fountains. The terminus fountain, designed by Domenico Fontana in 1587, is also known as the Fountain of Moses and often confused by tourists as the Michelangelo sculpture of Moses, which it is not. Michelangelo’s statue of Moses is in the San Pietro in Vincoli Church near the Oppian Hill. Entering the Park from the side of the Parrocchia Di San Policarpo Church you’ll immediately see the low arches of the Aqua Felice. As you walk under the Felice, the Claudia will reveal its grand arches. Finding the Aquas Anio Vetus, Marcia, Julia, Mariana and Anio Novus require a bit more of your imagination. The were either incorporated into the arches of the Claudia and Felice or destroyed. In 1122, Pope Callisto II built the Aqua Mariana, combining the water from the Julia and the Tepula, aqueducts emanating from the Alban Hills about 11km southeast of the city. A few hundred years later, the Mariana was gone. All that remains is a small stream that occasionally fills the ditch that once held the arches. The Aqua Tepula was abandoned early on. It never really produced enough water, and the water it did produces wasn’t much appreciated. The arches of the park were immortalized in the opening sequence of Fellini’s ‘La dolce Vita’. Parco degli Aquedotti – ‘La Grande Bellezza’ (The Great Beauty) where the mad artist Talia Concept runs head first into one of the aqueduct arches. 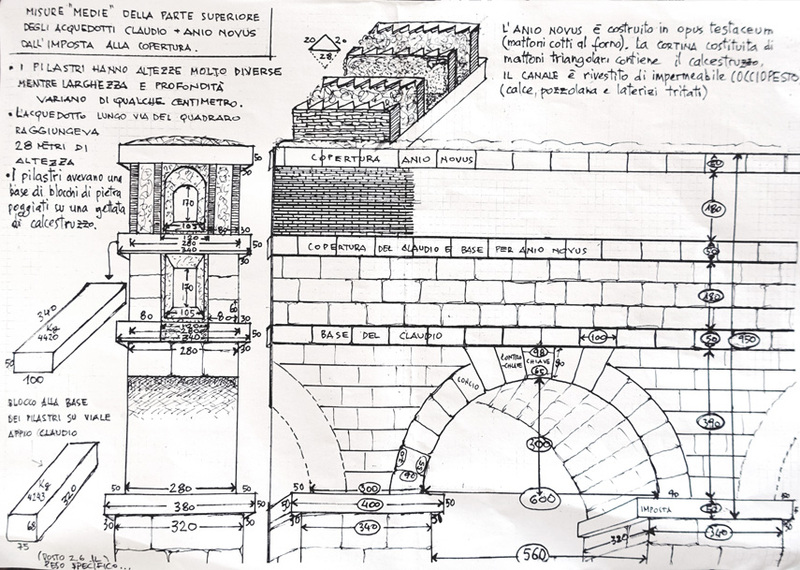 The following designs were given to us by, Lucio il Vecchio, a retired architect and one of the ‘Friends of the Parco degli Aquedotti’, a group of volunteers that care for the Park. Born Luciano Esposito in 1928, he hooked up with the US Army traveling from Salerno in March 1944, just after the last eruption of Mt Vesuvius. Lucio was 16 years old. When we met him in 2014, he still loved to tell the stories of walking in the pitch black of the eruption cloud as the US Commander would yell out, “Left Boys, Left Boys”, guiding the soldiers through the haze. These were the first English words he learned. Lucio came to Rome under the protection of the US Army, treating him along the way to chocolate, cheddar cheese and dried plums. At the beginning of the 4th century, the population of the city of Rome was estimated at 1.5 million. By the 7th century, Rome was reduced to a population less than 35,000. By the 7th century, most of the aqueducts were in various stages of decay and deterioration. The Catholic Church, now in charge of civic operations, chose to spend the City treasury on the Church rather than the aqueducts. Bathing was considered a luxury and frowned on by the church. This lack of hygiene enabled plagues and diseases that eventually killed over 1/3rd of Europe and continued to decimate humanity well into the 17th century. From the end of Papal rule in 1870 until 1938, the water supply of Rome was administered by the Municipal government. When Mussolini took power, he created the ACEA (Azienda Comunale Elettricità e Acque). The ACEA is still responsible for the water supply. Rome is now supplied with over 525 million gallons of water per day. The flow never stops. Most of it comes from karstic springs from the same location as the ancient springs that supplied water to Rome from the 1st century BC to the 6th century AD. With the exception of chlorination as a measure against organic pollution, the water does not require any chemical treatment for human consumption.